No law says that tax season has to be stress season. But perhaps for you it is. Sadly that is the experience for many. However, there is a better way! The transition from tax season stress to tax season simplicity and speed will initially sound hard, but it becomes easier with each passing year. It demands a little bit of discipline and work up front but the payoff is plenty when you can glide through each year’s tax season stress-free. You get the idea. You can increase the number of files to accommodate your personal tax situation. What is important is that you have a clearly labeled folder for EACH significant step or process involved in YOUR tax situation. This isn’t as hard to do as you might think. Just look at your most recent year’s tax filing and use it as a guide. 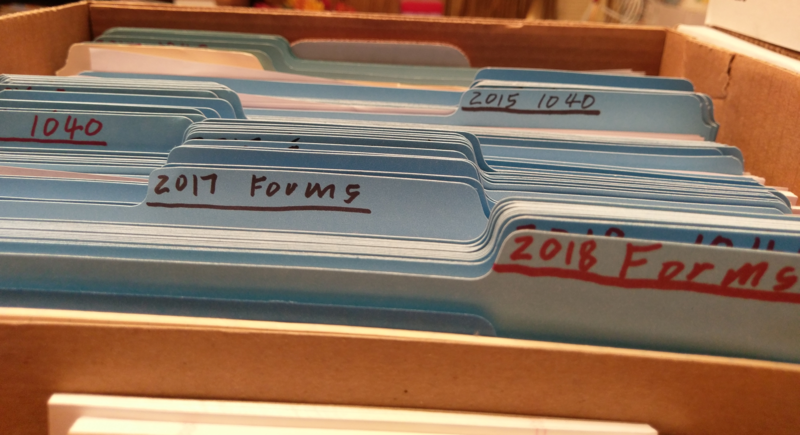 Any tax forms filed plus any supporting documentation involved are the blueprint to your individual folder labeling system. Especially think back to those specific times in which you were pulling your hair out searching for a particular record or document to allow you to move to the next line on that tax form. Create all your folders based on this tax review process. Remember, the key is to make it helpful and directly relevant to YOUR tax filing process. Once you complete this setup, the hard work is done. Now for the easy part. During the course of the year, each time you acquire a receipt, document, or record related to a particular tax or business category, you drop it into the corresponding folder. Depending on your circumstances, you could run the corresponding accounting report on your financial software and print out a hardcopy for the folder. Now I’m not saying that paying taxes is fun. Take that up with our least-favorite uncle (Uncle Sam). What I am saying is that you will be amazed at how much easier, smoother, and stress-free your hands-on tax process will be purely because everything is in the right folder at the right time. As you fill in your tax forms, no matter how complex, you will consistently be reaching for the corresponding folder to obtain the vital report, receipt, or information that each line on each form requires. You might be too late for this tax season, but that is no reason not to take action for next year’s tax season. The sooner you get started, the sooner you will find yourself actually enjoying how easy tax season is for you every single year. Now that’s a recipe for tax season simplicity and speed. You will finally spend less time stressing and more time enjoying life!